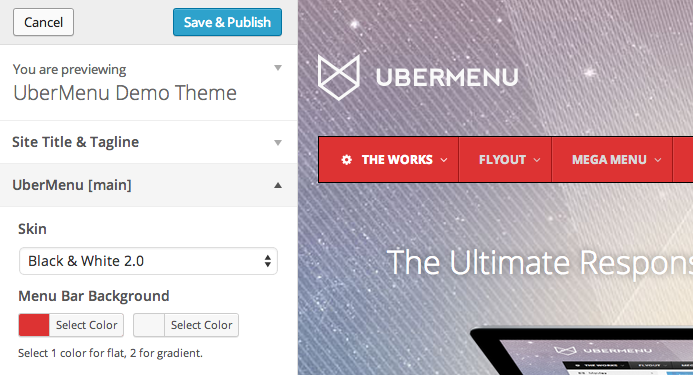 In the left panel, there will appear one tab for each UberMenu Configuration – so by default you will see UberMenu [main] to customize the main instance. Clicking the tab will reveal a variety of settings. Scroll through the settings in the pane on the left. You can change any of the settings, and the preview on the right will refresh with your changes. Each of these settings is an override – it will override the setting from the Skin preset. If you clear/reset the setting, the default from the Skin will be shown. For example, if your skin has a red background, clearing the color won’t set the background to transparent; it will just mean you’re not overriding the red of the skin. Remember, this is just a preview. To save your changes and make them appear to your site visitors, click the Save & Publish button.